Index - In English - Why are students occupying Kossuth Square? Why are students occupying Kossuth Square? 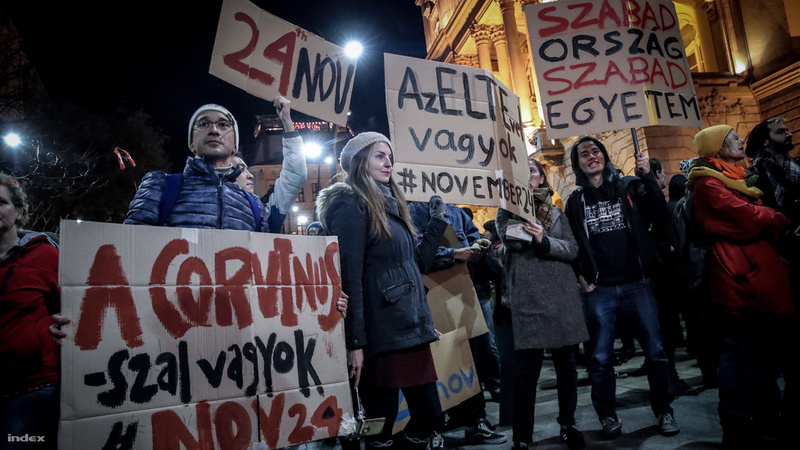 Protesters demonstrated on Kossuth Square in Budapest this Saturday, in defence of Central European University and against the education policies of the Hungarian government. They plan to occupy the square right in front of the Parliament until Saturday. Index explains why. There were approximately two thousand people attending the protest march on Saturday afternoon at Corvinus University, walking past the humanities campus of ELTE University, the Hungarian Academy of Science and the buildings of Central European University (CEU), arriving at the Parliament on Kossuth square. Protesters said they will occupy the square and hold debates and free lectures until the government signs the agreement enabling CEU to stay in Budapest, or until 1 December, the deadline set by CEU for starting to move to Vienna. At the Parliament philosopher Gáspár Miklós Tamás was the first to address the protesters. "We are here to protest the onslaught of the Hungarian government on academic freedom, freedom of teaching, of learning, of research, of creativity, of the life of the mind. This does not mean we are uncritical towards universities, universities should be – and are – criticised. But not by violence, not by coercion, not by interdiction, not by banning teachers and students, not by censorship, and not by deletion." He said it was time to end the political weakness, and that this protest stands not only in support of higher education, but against what he described as the Slavery Act, to demonstrate solidarity with the trade unions. The proposed amendment would curb employees rights by allowing employers to mandate a total of 400 hours of annual overtime work instead of the current 250. Tamás said that "however long and hard that road may be, we will walk it to the end", as this kind of solidarity is the way to go. The need for solidarity was a returning element of most other speeches. Ágnes Kövér-Van Til, the head of the gender studies department at ELTE said higher education is not the problem of the elites but of the entire society, and that it is telling that her discipline for which the government cut the funding is the one that studies the differences and discrimination amongst sexes. Other speakers talked about the importance of standing up for each other, one of them called the trade unions to join the occupation of Kossuth square. A CEU employee talked about how she imagined that despite her outrage about current system's operation, she can survive it by retreating to a middle-class lifestyle and not caring about societal issues (as is a common attitude in Hungary). Yet, "the government broke down her doors" and made her realise that there is no retreat, now is the time for solidarity and organisation. The long-drawn saga of the Central European University may already be familiar to those who follow Hungarian politics. In a nutshell, the fight over CEU started April 2017, when the Hungarian Parliament passed the amendment of the Higher Education Act in a day and a half. The amendment changed the requirements for foreign universities that operate in Hungary, deliberately putting CEU in a tough spot – fitting with the Government's still ongoing crusade against George Soros, who founded the university in 1991. CEU tried to abide by the new legal environment, establishing a campus in the State of New York based on a cooperation with Bard College and acquiring the signature of the New York Department of Education on the international agreement necessitated by the new law. The Hungarian Government, however, never signed the document, and with less than a week until the deadline, they are highly unlikely to do so. According to the government's circular reasoning, they are not signing the agreement until CEU adheres to the law as certified by the affirmative decision of the Hungarian Office of Education. However, the Office of Education cannot make that call, because CEU cannot provide the agreement the government is reluctant to sign. This demand refers to the mid-October government decree that effectively banned gender studies in Hungarian universities. This did not come without a warning: the Christian Democratic People's Party (KDNP, the coalition partner of Fidesz) and the pro-government media launched an all-out communication attack on gender sciences in September 2017. This August, the Hungarian Government introduced the proposal of the decree, giving a 24-hour deadline to universities to give opinions on it. As the competent ministry stated, there is no rational or economic reason for gender studies programs, as they "were not created with the requirements of the job market in mind, and they do not provide knowledge that can be put to practical use immediately and directly." 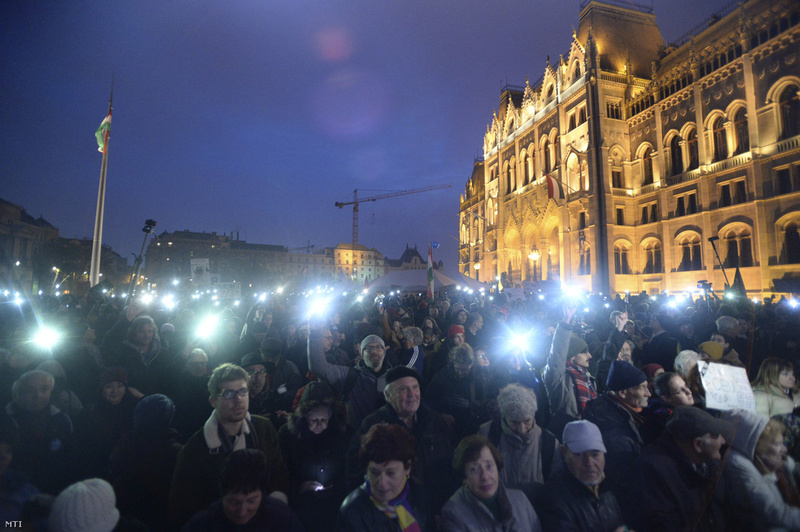 Protesters at Kossuth Square on the Demonstration for the freedom of education and science, 24 November 2018, Budapest. ELTE, the only other university affected by the decree besides CEU, claimed that the decision questions the autonomy of sciences and the freedom of education as they are declared in the Hungarian Constitution. Besides the strict austerity measures several university faculties had to introduce due to the low normative support they get from the state, the recent plans of higher education reform also give reasons to worry, say the protesters. Details are hazy, but it seems the government intends to transform Hungary's state-financed higher education into a system of private universities, extending the pilot model of Corvinus University, which is to be run by a foundation instead of the state. The other universities may not be operated by foundations but instead by state-owned corporations. According to HVG, this would mean that normative funding would be replaced by the state paying for programs it has "ordered", but universities could still start other programs as a business enterprise. This mode of operation may have its upsides – including more flexible operation, possibly higher wages for teachers as they will become employees instead of public servants, and private investment may also find its way into higher education –- but it can be highly problematic as well. Apart from the increase in tuition fees that would diminish the already pretty dismal social mobility, the model itself might bring about profit-oriented research, distorting scientific activity – profitable sciences could flourish, but others would definitely whither. The programs of the #OccupyKossuth movement can be found at their Facebook event. Cover: Demonstration for CEU, 16 November 2018. Photo: István Huszti / Index.